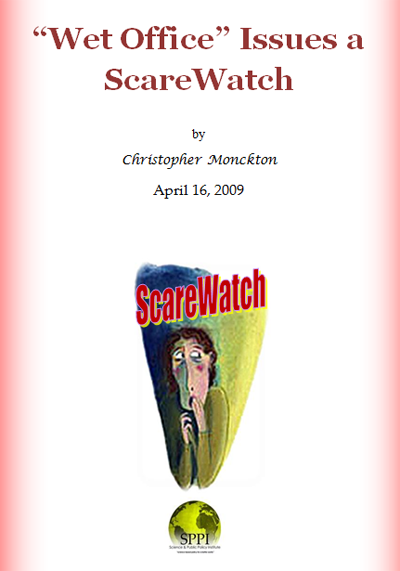 The scare: In early January 2008, as part of an apparently-coordinated spate of stories in the international news media about “global warming” intended to distract public attention from the coldest start to a Northern-Hemisphere winter in at least 30 years and the end of the coldest year for almost a decade, Reuters ran a story saying that scientists at the Hadley Center for Forecasting in the UK had proclaimed that 2009 will be “the warmest year since 2005” and “one of the top-five warmest on record”, at “more than 0.4 °C above the long-term average”. Whenever those whose livelihoods depend upon keeping governments convinced of the “global warming” scare are faced with mounting evidence that “global warming” is not occurring at the predicted rate, they keep themselves and the scare in the headlines by announcing a new prediction of doom. Reuters, playing along with the Hadley Centre, said, “Currently the warmest year on record is 1998, which saw average temperatures of 14.52 °C – well above the 1961-1990 long-term average of 14 °C.” The scientists are cited as “agreeing” that El Nino warming events such as that which caused the exceptional warming in 1998, and la Nina cooling events, “are playing an increasingly important role in global weather patterns”. Professor Chris Folland of the Hadley Center said, “Further warming to record levels is likely once a moderate El Nino develops.” Finally, Professor Phil Jones, director of the climate research unit at the University of East Anglia, said “global warming” had not gone away despite the fact that 2009, like the year just gone, would not break records. Sub specie aeternitatis, then, the correlation between atmospheric carbon dioxide concentration is very poor. Even in the Cambrian era, 550 million years ago, when CO2 concentration was up to 25 times today’s (IPCC, 2001), global temperatures were only 7 °C above today’s: yet the IPCC’s high-end projection is that if CO2 concentration by 2100 were just 2.7 times today’s (and on current trends it will only be 1.5 times today’s) temperatures might rise as much as 6.4 °C in 2100 compared with today. If our understanding of CO2 concentrations and temperatures in the past climate is correct, this high-end projection is mere fantasy. Seen in the perspective of the geological record that the IPCC and the media are so careful not to draw attention to, the Hadley Centre’s claim that 2009 will be “one of the five warmest years on record” is laughable. Most of the past 600 million years have been considerably warmer than the present. 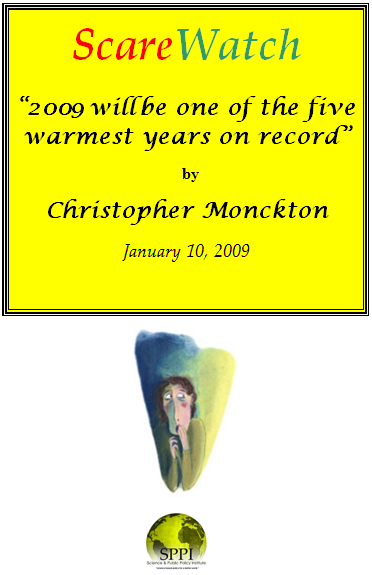 2009 “will be the warmest year since 2005”: Perhaps it will, perhaps it will not: however, the fact that a particular year will be warmer (or, for that matter, cooler) than four years previously is scarcely evidence of catastrophic “global warming”. 2009 “will be one of the five warmest years on record”: As we have shown, this assertion is true only if “the record” is confined to the global instrumental record dating back to 1880. Most years in the mediaeval, Roman and Bronze Age warm periods, and in the past 10,000 years generally, were considerably warmer than the present (Curry & Clow, 1997). Global temperatures have in fact been rising since 1700, towards the end of the 70-year Maunder Minimum, during which solar activity was at its lowest for 10,000 years. Temperatures reached a recent peak in 1998, during the great el Nino that marked the end of the 70-year solar Grand Maximum, during which solar activity was almost at its greatest for 11,400 years (Solanki et al., 2005). During the first 270 years of this 300-year period, humankind’s activities were simply not on a large enough scale to have exercised any significant influence on temperatures. In the past 30 years, during which a human influence is theoretically possible, temperatures have risen at a rate equivalent to ~1.5 °C/century: yet between 1910 and 1940 global temperatures rose at up to 1.8 °C/century, even though humankind cannot have contributed significantly to the warming. Since temperatures rose for 300 years to 1998, it is no surprise – indeed, it is a truism – that many recent years have been among the warmest years in the period, and this fact is certainly not evidence for catastrophic “global warming”. The fact that recent years have been warmer than earlier years is chiefly evidence of the exceptional increase in solar activity between the Maunder Minimum and the solar Grand Maximum. 2009 will be “more than 0.4 °C above the long-term average”: It will not. It will be about 0.4 °C above the arbitrarily-chosen mean global surface temperature for 1961-1990. The implied warming rate – equivalent to little more than 1.5 °C/century since 1980 – is well below half the 3.6 °C/century centennial warming rate predicted by the IPCC as its central estimate to 2100. If the observed warming rate since 1980 persists – and it is not very likely to do so – then temperatures by 2100 will be well below the 2 °C increase that is generally accepted as safe, and there will be no need for the expensive array of cap’n’trade bureaucracies or carbon taxes that are proposed by governments worldwide. “Currently the warmest year on record is 1998”: If the generally reliable US temperature record is correct, the warmest year since global instrumental records were first kept in 1880 is in fact 1934, and 1998 only exceeded it because there was an exceptional el Nino that year – an alteration in global ocean currents that occurs every four years or so and releases stored heat from the oceans to the atmosphere, causing a temporary warming. El Ninos are usually followed by la Ninas, similarly short periods during which the oceans are taking heat out of the atmosphere and cooling it. The year 2008 was c00ler than its predecessors since the turn of the millennium because there was an unusually profound and enduring la Nina early in the year. The la Nina has now come to an end, which is the real reason why the Hadley Center can so confidently predict that 2009 will be warmer than 2008. It probably will be, but the warming between 2008 and 2009 will be chiefly attributable not to catastrophic manmade “global warming” but to the end of the 2008 la Nina. El Ninos and la Nina’s “are playing an increasingly important role in global weather patterns”: As usual when “scientists” make pronouncements such as this, implying that “global warming” is responsible for some change or another in previously-established weather patterns, journalists do not bother to ask them for their evidence. It is therefore difficult to comment definitively on the cited statement. However, it is worth recording that there has been no particular increase in the frequency of el Nino or la Nina events, which occur approximately every four years, or in their intensity. The 1998 el Nino was certainly a rarity, but there have been two previous el Ninos of equivalent intensity in the past 300 years. 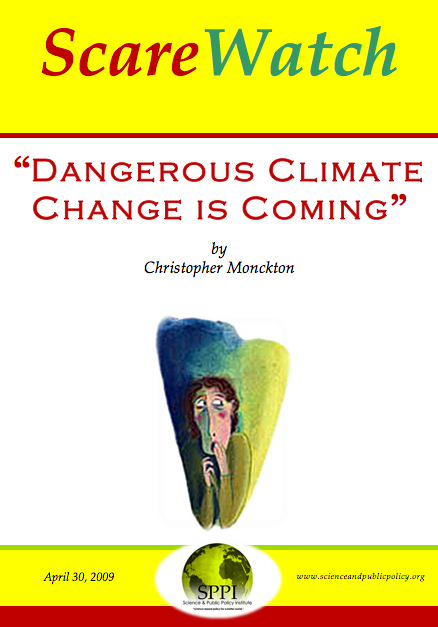 And, even if el Ninos and la Ninas were becoming more frequent or more intense, that fact would not necessarily indicate that manmade – or any – “global warming” was the cause. “Further warming to record levels is likely once another el Nino develops”: This may or may not be true. However, it is not likely that another el Nino as intense as that of 1998 will come along anytime soon: and, as Figure 1 demonstrates, there have been 11 years of global cooling since 1998, so an el Nino sufficient to set a new “record” for global temperature would have to be even more intense than that of 1998. This is not impossible: but it is unlikely. Even if it were to occur, the mere fact of continuing “global warming” would tell us nothing of the cause of that warming, which could be an after-effect of the 70-year period of intense solar activity that ended in 1998. The influence of the 1998 el Nino is evident in the graph from the SPPI’s composite global-temperature index. Even the quite strong el Nino at the beginning of 2007 did not match that of 1998 either for intensity or for duration, and it was followed by a la Nina even more profound than that which followed the 1998 el Nino. The graph demonstrates that the Hadley Centre’s prediction that the next el Nino year will set a new global record for temperature is unlikely, though not impossible. The pink region of the graph is the IPCC’s range of projections for global temperature increase: the straight red line through the data curve shows that there has been a slight falling trend in global temperatures since the great el Nino of 1998. “‘Global warming’ has not gone away”: It has long been settled science that enrichment of the atmosphere with carbon dioxide will be likely to cause some warming. Since the concentration of carbon dioxide continues to increase (albeit at a rate so far below the IPCC’s projections that its predicted temperature increase to 2100 must now be halved), it is true that some further warming, eventually, is to be expected. However, as figure 1 shows, “global warming” has now “gone away” for 11 straight years, indicating the power of natural influences – notably the intense el Nino of 1998 and the prolonged recent inactivity of the Sun, with as many as 266 spotless days in 2008 – to overlie and even to extinguish the comparatively small influence of anthropogenic “global warming”. End of scare.